Helen Thomas’ decision to take her disparagement of Zionists from off the cuff (last May) to on the record (last month) has led a journalists’ group to consider dropping her name from a lifetime achievement award. Thomas, a 67-year-veteran of Washington reporting, resigned from her job as a columnist at Hearst last June after remarking to a video blogger that Jews “should get the hell out of Palestine” and “go home” to Poland, Germany, and the United States. She later apologized, but her remarks in Michigan on Dec. 2 have raised fresh concerns about the sincerity of the apology. “Ms. Thomas’ most recent remarks led to calls for a reconsideration of the issue by the executive board,” said Hagit Limor, president of the Society of Professional Journalists and an investigative journalist for WCPO-TV in Cincinnati. The decision will be considered Jan. 8 at a meeting of the society’s executive committee. Ahead of the meeting, the society posted on its online magazine Quill what it said were two typical letters – one for renaming the award and one against. Limor said the society, which advocates for press freedoms and promotes high-quality journalism through scholarships and awards, had been in touch with Thomas. A message left at Thomas’ home by JTA was not returned. After her June remarks to blogger Rabbi David Nesenoff, the society considered calls from members and some Jewish groups to rename its Helen Thomas Award for Lifetime Achievement but decided against it, noting her apology and the off-the-cuff nature of the remarks, an official with the organization told JTA. That changed a few weeks ago with her speech in Dearborn, where Thomas grew up. 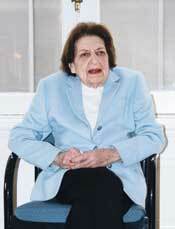 Wayne State University, her alma mater, immediately withdrew its Helen Thomas Spirit of Diversity in the Media Award. Thomas, born to Lebanese immigrants, for decades was the White House correspondent for the United Press International wire service. She was among the first female journalists in Washington to break out of the traditional first lady coverage, scoring newsmaking interviews with Presidents Johnson through Clinton. When she left UPI to become a columnist for Hearst, she emerged as one of the first and sharpest critics of the Iraq war. Countering was Lloyd Weston, a retired publisher and editor. “The same First Amendment that protects my right to be a Jew and a Zionist in America protects Helen Thomas’ right to express her opinion of Jews and Zionists, no matter what that opinion may be,” said Weston, a Wayne State alumni who said his professors were likely “turning in their graves” at the university’s decision to rescind the honor. The Society for Professional Journalists, established in 1909, granted Thomas its first lifetime achievement honor in 2000, and pledged to name subsequent awards for her. It has been awarded nine times since its debut. The award has no cash value. On Saturday, the society’s executive committee could decide to rename the lifetime achievement award or not, or it could refer the matter to the full board, an official said.